Please contact the CASD office directly to register. 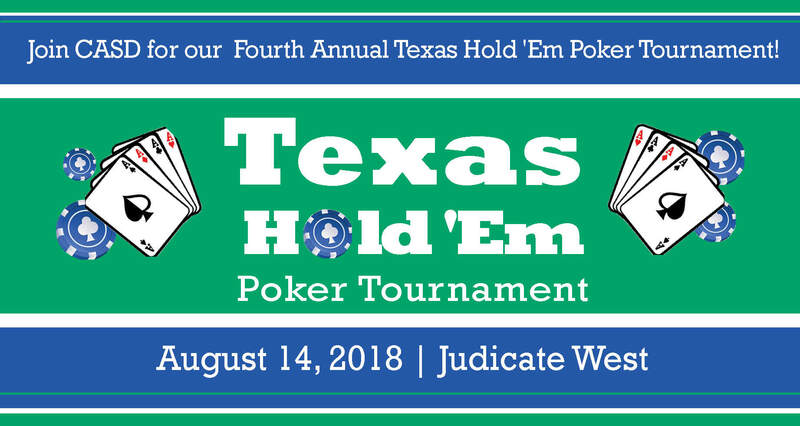 Join CASD for our fourth annual Texas Hold 'Em Poker Tournament! All proceeds from this event will benefit the CASD Foundation program designed to provide paid fellowships for trial lawyers in the making! $100 to play and compete amongst your peers. Those eliminated in the early rounds can buy back in until 7pm. Prizes will be given to 1st, 2nd & 3rd place, as well as the bragging rights! Food, drinks & lots of fun included! Sign up today! Limited openings available.